How do I best prepare my medium-length fur cockapoo to go outside for her 15-20 minute potty breaks in really low temps & snow? I was recently blessed with my first grandchild! My dogs are great with older children but have never been around a baby. What is the best way to introduce my two 10-year-old Dobermans to a newborn in the house? I have a 5-year-old rescue that will chew fabric such as blankets, her bed, and even the carpet if not watched and is also terrified of lights such as the flash from a camera and noises such as from toy guns and thunder. How can we soothe her anxiety? What should I consider when looking for a place to board my cat? We have two new rescues that that are aggressive towards each other and me, can you evaluate them and determine if they will get along? I have a new rescue dog. What is a good age to bring them to a training class? PLEASE SHARE: Excellent new from Scotland! 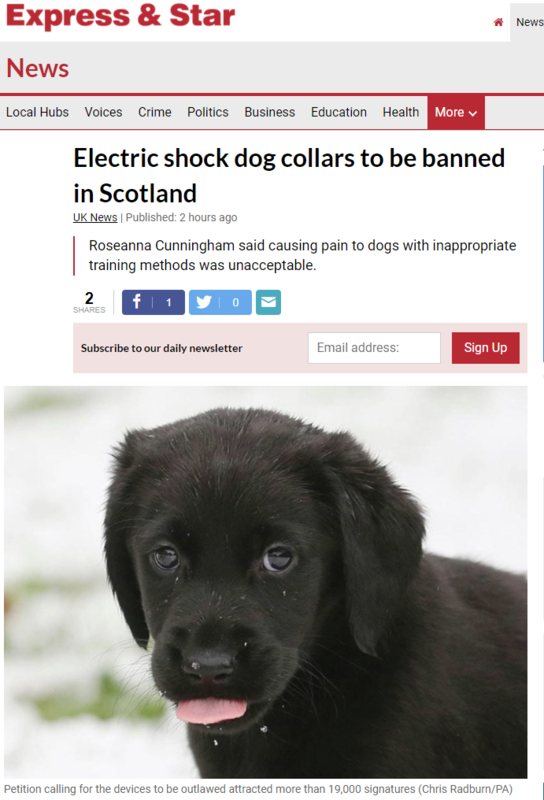 Environment Secretary Roseanna Cunningham said causing pain to animals by “inappropriate training methods is clearly completely unacceptable”. How do I help my new cat get to overcome her fear and acclimate to her new home? How do I deal with a dog that hangs around in the kitchen when I am preparing food? My dog barks incessantly, how do I get him to stop barking? When getting a kitten is it better to get two? Should we get two puppies at the same time? 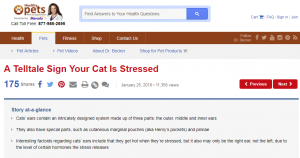 How does Green Acres Kennel Shop determine what pets foods they sell? This article from Karin Brulliard in The Washington Post discusses some new theories on why dogs eat feces. The paper does not indicate why dogs eat feces. In fact, no evidence was found that connects poop-eating with age, diet, or compulsive behaviors such as tail-chasing. The researcher behind the paper has theorized that dogs eat fresh poop to destroy parasite eggs found in the poop. When they consume the poop the acid in their stomach destroys the eggs. Ma recommendation if you have a poop-eater is to pick up the poop and dispose of it immediately. It works. Always. How Can I Tell When My Dog Is Anxious or Fearful? As a Certified Dog Behavior Consultant (CDBC) I work with clients with dogs with a wide variety of anxiety related issues. In some cases, the dog has a minor fear towards a particular type of person, and other times the dog might be terrified. Most people recognize the latter, but many see a dog that is not reacting as being “fine” or “okay” when in fact, these dogs can be very afraid. A dog that is not reacting may be frozen in fear. It is important to understand how your dog expresses their emotions so that you can help them when they are frightened. Dogs are visual communicators and in most cases do an excellent job of trying to tell one another and us when they are uncomfortable. This starts with subtle body language and can rapidly escalate to vocalizations and actions such as lunging, snapping, and biting. 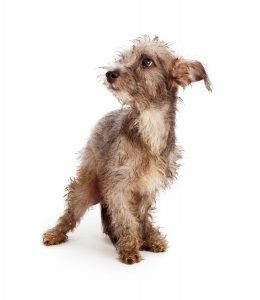 Below you will find several resources that will help you to understand better what your dog is trying to tell you. 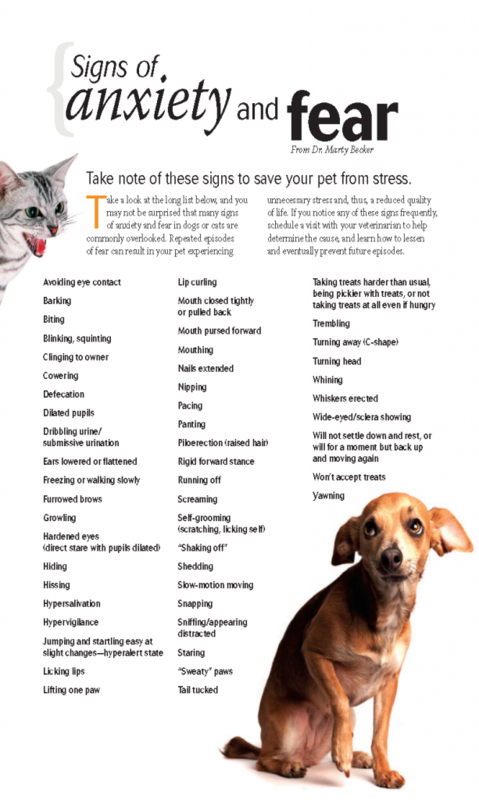 Veterinarian Dr. Marty Becker has created the following poster as an educational tool, so that pet parents are aware of signs that their pets are stressed and afraid. If your family includes children and a dog, if you have children that spend time with friends and family members that have a dog, or if you have a dog that spends any time around children, you, your children, and your dog will benefit from your reading A Kids’ Comprehensive Guide to Speaking Dog! by Niki Tudge. The goal of this new book from author Niki Tudge and Doggone Safe is to provide a resource that anyone can use to teach children how to be safe around dogs by teaching them how to “speak dog.” As a dog training instructor that teaches both adults and children how to train their dogs, we make teaching canine body language part of our classes. What I have learned over the past 22 years is that before taking a dog training class, even most adults are not aware of most aspects of “speaking dog,” which is why I believe this book will be of value to both children and adults. A Kids’ Comprehensive Guide to Speaking Dog! 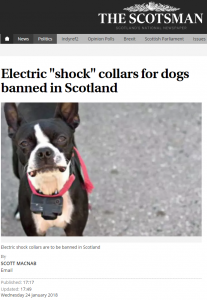 is written to be used as an interactive resource and uses cartoons and photographs to illustrate body language dogs use to signal when they are happy, afraid, and angry. By teaching children, and adults, how to read and respond to these signs the book helps keep people and dogs safe. The world is full of children and dogs, and it is essential that we teach them how to interact safely. A Kids’ Comprehensive Guide to Speaking Dog! combined with a parent or teacher does just that. I give this book five paws! 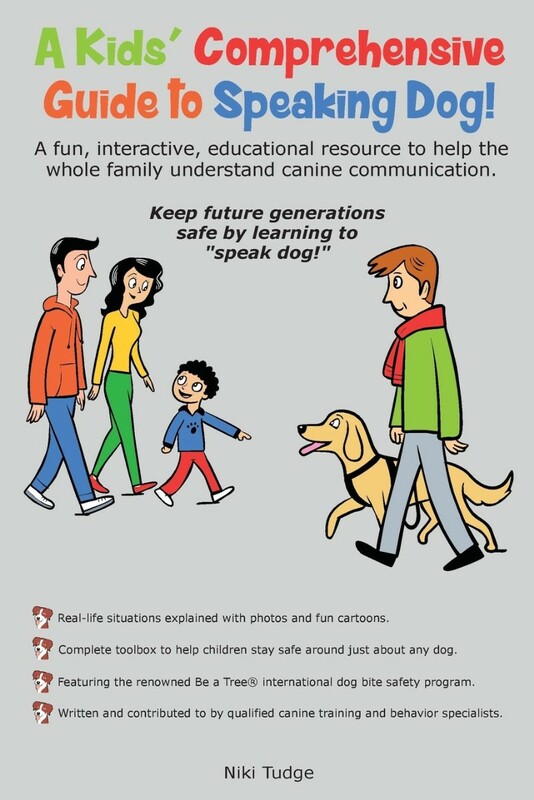 You can purchase A Kids’ Comprehensive Guide to Speaking Dog! at Green Acres Kennel Shop. SUGGESTED AUDIENCE: Anyone who interacts or wants to interact with dogs, on any level. 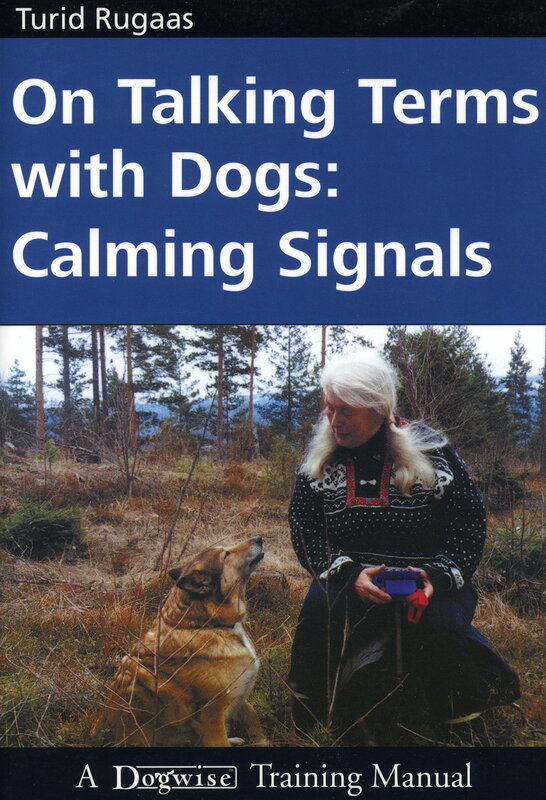 This book, while few in pages, and its author Turid Rugaas, have influenced my understanding of dogs more than any other book or seminar I have read or attended. 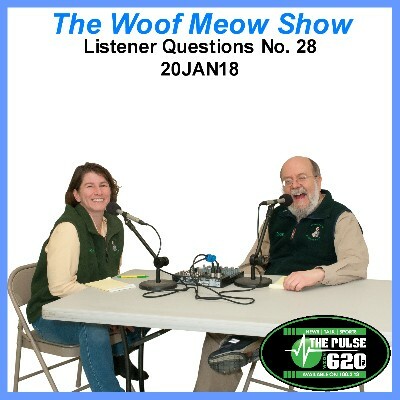 This gentle, kind, woman is incredibly knowledgeable about canine behavior and ethology. She has taught me and many others how to live in harmony with our dogs by helping us to better understand what they are trying to tell us, and in turn she has taught us a better way to express ourselves to our dogs. 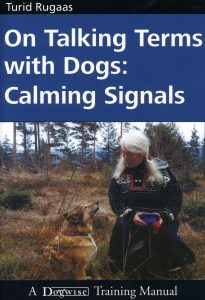 Full of photographs illustrating each point, On Talking Terms With Dogs: Calming Signals focuses on how dogs use specific body language to cutoff aggression and other perceived threats. Dogs use these calming signals to tell one another, and us, when they are feeling anxious and stressed. This book will help you learn ‘dog language’, for which you will be rewarded with a much better understanding of your pet and his behavior. On Talking Terms with Dogs: Calming Signals should be required reading for everyone who has or aspires to work with or share their life with a dog. 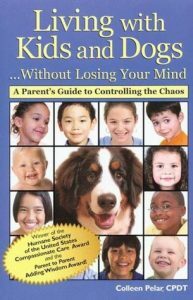 Colleen Pelar, CPDT and author of Living with Kids and Dogs…Without Losing Your Mind: A Parent’s Guide to Controlling the Chaos, deserves a huge paws up for her wonderful book. This trainer/author recognized a need for a realistic, down to earth discussion about how to successfully manage the mayhem. Colleen is a Certified Professional Dog Trainer whose focus is on family based classes and she has personally survived the chaos that ensues when trying to raise kids and dogs together. For many, it is a deeply ingrained belief that kids and dogs belong together and that no childhood is complete without a dog. Reality however is often very different. The simple fact of the matter is that sometimes children and dogs do not mix well. There is much data out there discussing dog bites and children, however very few books give us good, positive solutions. 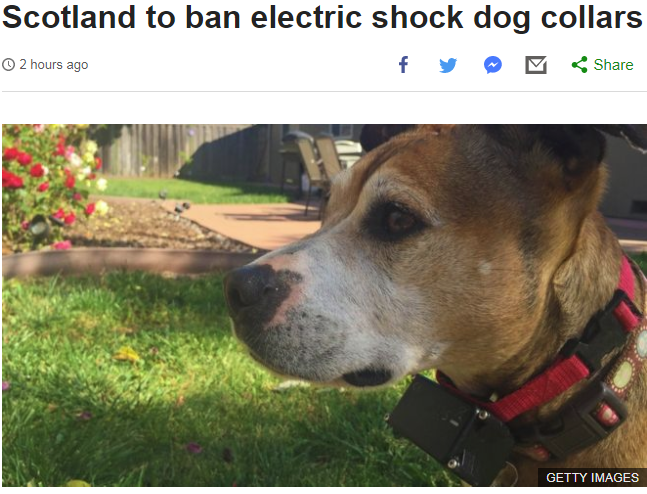 Yes, we all know that you should never leave a child and a dog together unattended, ever. If only it were that simple! Colleen looks at reality and accepts that kids will be kids and dogs will be dogs, and works with that premise. She does a great job in her discussion of solutions to the many problems faced by parents when trying to handle chaotic situations, and helps to lay the foundation so that your child and dog can build a positive relationship. The chapters are broken down nicely and cover whether or not you should get a dog (if you do not already have one), the fundamentals of assessing the dog you have (if you do already have one), and looking at growth stages of children and the various approaches that you will need at these different ages. Time is spent on teaching your child how to interact appropriately with all dogs and becoming your dog’s advocate. Colleen discusses “deal breakers” such as resource guarding and how to prevent bites. She explains the equipment you will need to train and manage your dog, and introduces ideas such as boundary ropes. Also discussed is the difference between your children and their friends and how you should handle situations when your kids have little visitors. 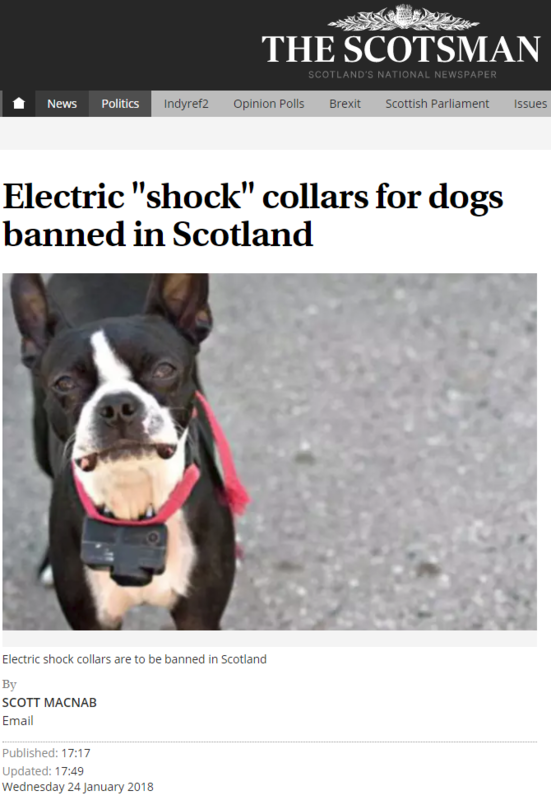 Colleen tries to hammer home the idea that this pet, while you may have your children in mind, is ultimately going to be the parent’s and thus the parent’s responsibility. The final chapter of Living with Kids and Dogs…Without Losing Your Mind: A Parent’s Guide to Controlling the Chaos covers the topic of how to help your children say goodbye to your dog, whether it is because your dog has lived a full life and passed on or if it is because you have made the decision that your dog would be better off in a home that does not have as much activity. I must admit that this chapter put me in tears. While Colleen does not go into the fundamentals of training with her book, she does give an overview of how to train each behavior she introduces so that the average reader would have the ability to implement these behaviors on their own. She also includes games the kids can do to help them learn how to behave around dogs and exercises for them to assist with training. The author indicates times at which families should seek professional help with their pets. At the end, there is a nice listing of resources for those that want further information or assistance. The important points of each chapter have been graciously summarized at the end so that you can glance at those first to determine your need for that chapter. This is not a cumbersome book and is one that you can easily read when the little one is down for a nap. I highly recommend Living with Kids and Dogs…Without Losing Your Mind. It is by far one of the best books I have read in a long time, fills a long standing void and is a must have for anyone who has children and dogs living under the same roof.